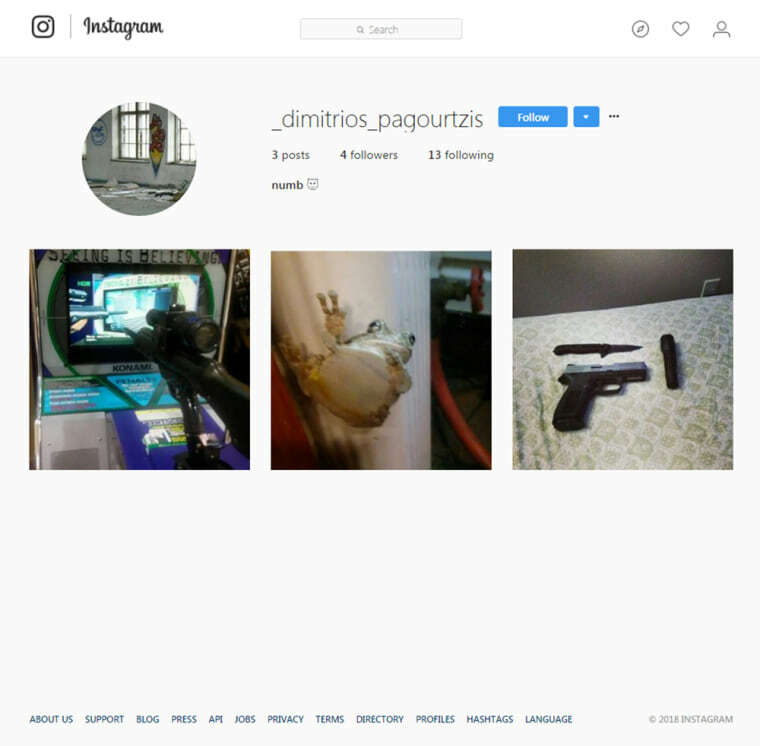 Three weeks before he allegedly killed 10 people at a Texas high school, Dimitrios Pagourtzis posted a photo to what appears to have been his Instagram account with a picture of a knife and a handgun atop a mattress and a profane caption. Another Instagram post was a picture of the arcade game Silent Scope — which allows players to pretend they are a sniper using a controller shaped like a rifle — captioned with a smile emoji. A third photo: the underside of a frog. He followed only 13 other Instagram accounts, and eight of them were fan pages for firearms. The others include the official accounts for the White House, President Donald Trump, Ivanka Trump and Melania Trump's official @FLOTUS account. On his Facebook page, Pagourtzis posted a photo on April 30 that seems chilling in retrospect: a T-shirt spread out on a bed with the slogan "Born to Kill." The same day the 17-year-old put up a photo of a trenchcoat — like the one classmates say he wore to school most days — covered with pins, including the Iron Cross, a German military medal sometimes associated with Nazis, and a symbol of a goat head that is connected to the Church of Satan. The caption below the photo appeared to be an explanation of the meaning of some of the other pins: He captioned the photo: "Hammer and Sickle = Rebellion," "Rising Sun = Kamikaze Tactics," "Iron Cross = Bravery," "Baphomet = Evil," "Cthulhu = Power." While posts could provide clues to Pagourtzis' interests and state of mind before he allegedly barged into a classroom and started shooting, not all of them were so darkly themed. In one selfie from May 2, Pagourtzis wore a backwards baseball cap adorned with a pink and purple striped pin that is associated with bisexual pride, according to dozens of online retailers. In his profile photo, he wore a black hat with a white peace sign on the front. A few details of Pagourtzis' life began to emerge in the hours after the shooting. A newspaper story showed he was on the honor roll at Santa Fe when he was a freshman. He had played on the Santa Fe junior varsity football team but was not listed on the current roster. Pagourtzis' family said in a statement on Saturday that they were "saddened and dismayed" and said they extend their "heartfelt prayers and condolences to all of the victims." "We are as shocked and confused as anyone else by these events that occurred. We are gratified by the public comments made by other Santa Fe High School students that show Dimitri as we know him: a smart, quiet, sweet boy. While we remain mostly in the dark about the specifics of yesterday’s tragedy, what we have learned from media reports seems incompatible with the boy we love," the statement read. "We share the public’s hunger for answers as to why this happened, and will await the outcome of the investigation before speaking about these events." The family said they are cooperating with police and asked for privacy. One student, who was 200 feet away from the shooter when she was told someone had a gun, said she was shocked when she learned Pagourtzis was the alleged gunman. "He seemed like a nice kid, but I didn't know him personally so there could be something going on that nobody knew about," sophomore Bailee Sobnosky said. His family attended a Greek Orthodox church, and he participated in traditional Greek dance. One person who knew him from church said he was stunned to hear he might be involved in a horrific crime. "He's quiet but he's harmless. He's just a regular kid, nothing unusual about him at all," he said.